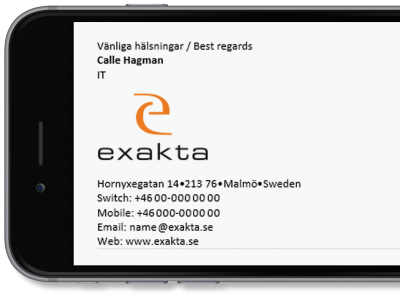 Exakta Group is a leading digital communications and print company based in Sweden. It provides the widest range of media services in the market, including graphic design, digital publications, photography & video production, and business analysis. Exakta prides itself on its commitment to continuous development of technology, service and quality. Exakta Group had been using Exclaimer Signature Manager Exchange Edition before discovering Exclaimer were soon to be releasing a solution for Office 365. Exakta hadn’t yet made the move to Office 365, and after having a great experience with Signature Manager Exchange Edition, it held off on the migration until Exclaimer Cloud - Signatures for Office 365 was released. “Having used Exclaimer Signature Manager Exchange Edition for a few years, we wanted the same simple and reliable management of signatures when we migrated to Office 365,” said Mr Hagman. “We also wanted a solution that would apply centrally managed signatures to all email, no matter what device it is sent from,” continued Mr Hagman. Exakta began testing Exclaimer Cloud - Signatures for Office 365 during its transition from Exchange to Office 365. “I started to use Exclaimer Cloud - Signatures for Office 365 a week before our Office 365 migration. I had everything setup and my first signature applied within 30 minutes; the setup wizard was very smooth,” he stated. “Exclaimer is also excellent to work with as both sales and support are very service-minded and helpful. Nothing seems to be a problem, and every quote, trial license and support response is delivered as promised,” finalized Mr Hagman.